Sky Harbor, What were you thinking? I fly to Phoenix Sky Harbor airport regularly as my employer has a large operation in the area and my mother, as well as several old friends live in Phoenix. Sky Harbor airport is not a great cathedral of aviation. Like all airports, Sky Harbor is constantly under construction. The master plan calls for terminals two and three to be completely rebuilt, which will include the eventual closure of the original terminal two. It can’t happen soon enough. Terminals two and three are old, ugly, inefficient and have almost no food and beverage options beyond the too-small security checkpoints. The main issue is who and how it will be paid for. 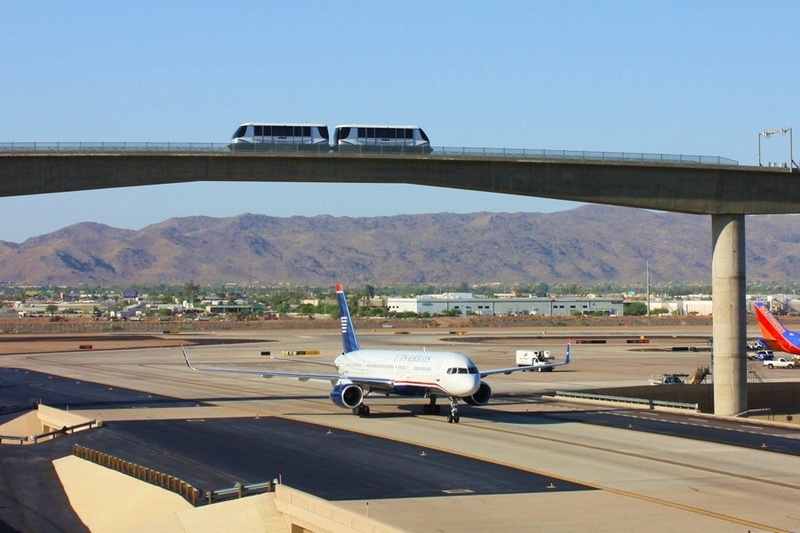 Currently, Sky Harbor is in the multi-phased construction of the Sky Train system. This automated people mover will eventually connect all the terminals to the remote parking lots, the rental car center, and the Phoenix METRO light rail system. Part of the design I can’t wait to experience is to have the Sky Train tracks travel via a bridge over an active taxiway to get to the terminals. It is an audacious piece of architecture that will provide geeky thrills if you are lucky enough to be on the bridge as an aircraft taxies underneath. Here’s the problem. According to Wikipedia, the bridge is tall enough to let a Boeing 747 pass under the bridge but not an Airbus A380. The odds of sending an A380 or a 747 to Phoenix are slim right now. The local market can’t sustain it. The largest aircraft that currently makes sense for Phoenix is the Boeing 777-300. It has almost as much capacity as a 747 but is considerably more fuel-efficient. The new Boeing 787 and upcoming Airbus A350 are also logical choices, as they were developed with the idea of connecting smaller markets such as Phoenix to long-haul international destinations. But who knows what the future will bring? The population of Phoenix and surrounding Maricopa County is growing at a very quick pace. USAirways will soon be American Airlines. American works very closely with British Airways through the Oneworld global alliance. American Airlines will inherit a very large hub in Phoenix through the merger. Hubs are meant to create critical mass by connecting many more passengers than the local market could ever support. This is already the case in Phoenix. There is a possibility, however slight, that that BA could potentially send an A380 to Phoenix with many passengers that will connect beyond Phoenix with American Airlines. British Airways is in the process of taking delivery of a fleet of shiny new Airbus A380s. So the question is why this situation with a brand new infrastructure? It could have been that from an engineering standpoint it was not possible to make the bridge high enough. Did the budget for the Sky Train make it impossible? Were the planners overlooking this detail or did they decide that the odds of an A380 visiting Phoenix are too small? This does not necessarily mean the A380 can’t fly to Phoenix. It will probably have to take a longer taxi to its gate – that is, assuming the airport is willing to upgrade gates to handle the 500 plus passengers and their luggage. Regardless of the reasons, I really think the powers that be at Phoenix blundered a bit here. Which doesn’t mean I’m not really excited about the potentiality of riding the Sky Train on my next trip to Phoenix. Way to go Phoenix Sky Harbor! “It’s the same dog food in coach or first class. In first class it just looks nicer.” – An honest airline employee. Meals, what meals? Nobody serves them anymore or they make you pay. If you get a second bag of peanuts you’ve scored! 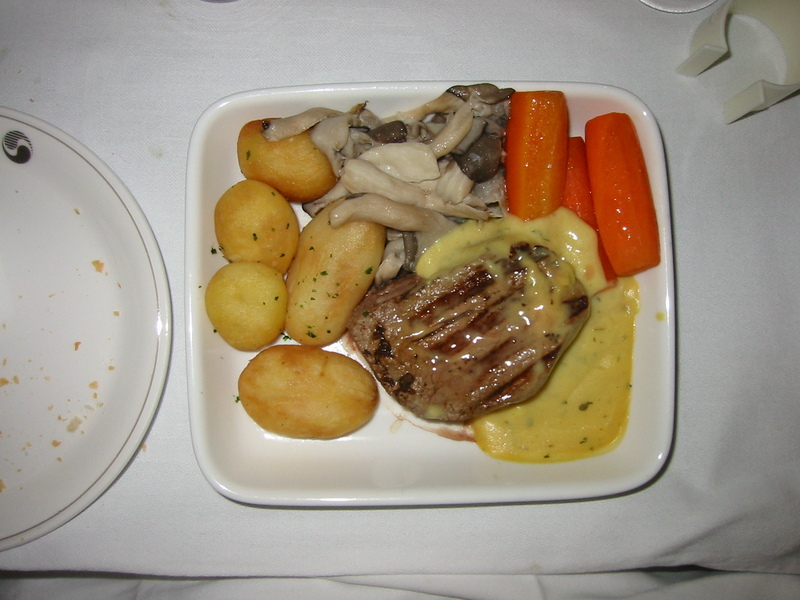 Airline meals still exist and are usually part of the ticket on transoceanic flights. However the flights that don’t have meal service or have the buy-on-board options are getting longer and longer. Once upon a time even domestic airlines competed on good catering, even in coach. Midwest Express and Kiwi Airlines were the most recent examples. Both are long dead. The great catering didn’t get more people on board because the only thing most short- and medium-haul passengers care about is spending as little money as possible. And to the airline, cost per passenger trumps everything. Saving a few cents multiplied by the thousands of meals a large carrier might have to provide every day can lead to huge cost savings. Now, when you do get food, whether or not you actually want to eat what is put on the tray before you is another question altogether. Beyond the logistics issues, meals must be palatable to passengers from around the world, which explains why they are often so bland. In the business- or first-class cabins you get many more options and the food starts tasting and looking like something you might want to eat. Here the airlines do compete with each other. There usually is a constant flow of liquor and snacks, but even in these cabins airlines are being forced to cut back. Over the years I’ve had dreadful meals. Others have been comparable to fine dining. It’s pretty much a hit or miss proposition. I learned to love caviar when I worked for American. The most satisfying meals I’ve had were on long-haul flights to Europe or Asia, the best example being on Korean Airlines when I flew to Seoul. After two weeks of eating local cuisine, my German craving for protein kicked in big time so I ordered the filet. The attendant asked me how I would like my filet cooked. I requested medium-rare. To my utter shock and delight, my main course came with a perfectly cooked medium-rare filet. How they managed to do that in a warming oven I’ll never know. All these many years later, I still consider this my favorite meal. I’ve had transatlantic first-class meals that didn’t wow me as much as this business-class meal. Unfortunately I’ve had some awful ones as well. I was flying USAirways from Frankfurt to Philadelphia in coach once. Unlike my flight on Korean, I wanted something a bit lighter after spending the previous 10 days in the land of wurst and schnitzel. I requested the vegetarian pasta course. What was the salad that came with it? A green pasta salad! Somebody at the USAirways Frankfurt catering company obviously wasn’t thinking. At that point, a bag of pretzels from Southwest would have been much, MUCH better! So yes, it can be dog-food awful, nonexistent, or sublime. It’s all a crap shoot based on where, when, and what cabin you are in. Bon Appetite! 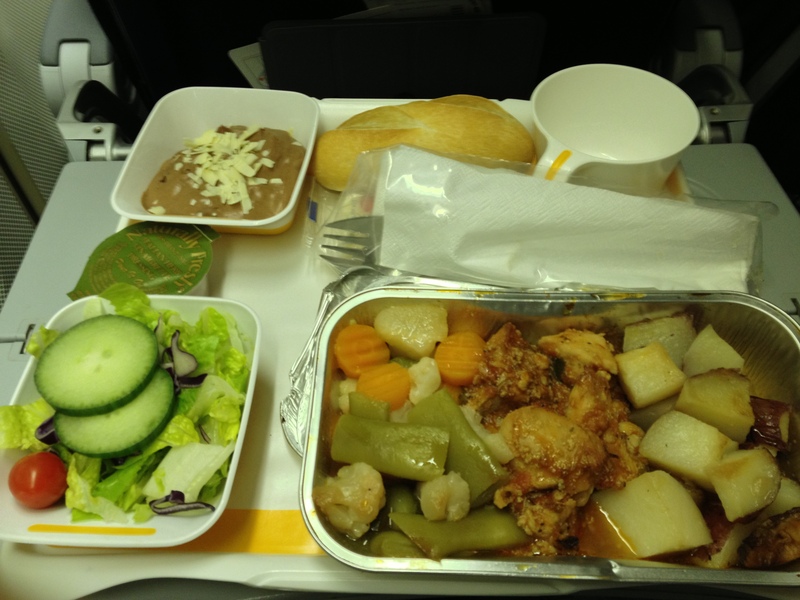 For examples of the best and worst food in the air, take a look at airlinemeals.net. One of the best airline industry bloggers bar none is Brett Snyder of The Cranky Flyer. Brett has a reviews of many airline meals. As a kid, and as an adult aviation geek, I loved roaming the departure areas of the airport. 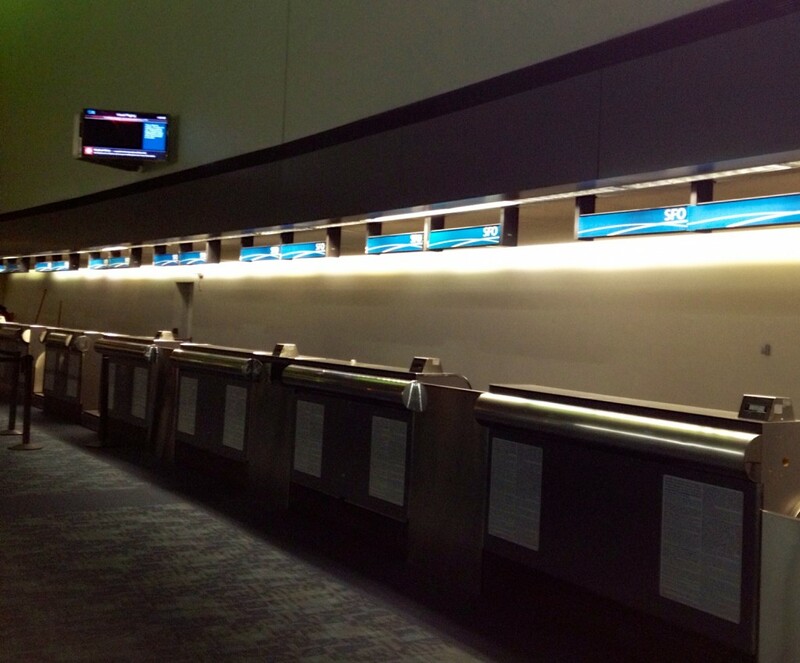 The check-in counters always held the promise of adventures to exotic, far-flung locations. Each logo had a story to tell. It was a symbol of a fantasy wish to escape my humdrum life. Today that is changing in two ways. Several large international airports have moved to a shared-facility model. The monitor above the check-in desk advises what airline is checking in. Right now it could be Thai to Bangkok. An hour later it will be USAirways to Charlotte. Nothing is permanent. In many airports, the staff isn’t employed by the airline but by the airport authority or a ground handling company on a contractual basis. In some cases, the common-use check-in desks or even entire terminals are branded by airline alliances such as Star Alliance, etc. ; the airline actually checking in passengers is secondary. Today most airlines market their alliance memberships almost as much as themselves. The second change is found in almost all domestic US airports. Merger mania has left us with four major airlines – Delta, United, Southwest, and soon a newly merged USAirways and American Airlines – plus a few niche players. The ones that are left are doing more with less real estate. If the airport doesn’t have hub or focus-city status, there are probably acres of empty counter space. Some airports still can fascinate, however. O’Hare’s international terminal five still has dedicated counter space for its tenants. Sometimes they are shared and crammed with multiple airline branding. It works if one airline has a morning rotation and the other airline is an evening visitor. Often times the airline might not even be a daily visitor. Yet regardless of who is currently using the terminal, every airline’s logo stays on display. O’Hare really needs an expanded international terminal, but I fear the new facility, if built during my lifetime, will opt for efficiency. I doubt it will retain its old-fashioned charm. I checked the flight status for my departure tonight at about 11:00 this morning. It has already been delayed by over an hour! There are two probable causes. The first, and less likely reason is that there are mechanical issues. 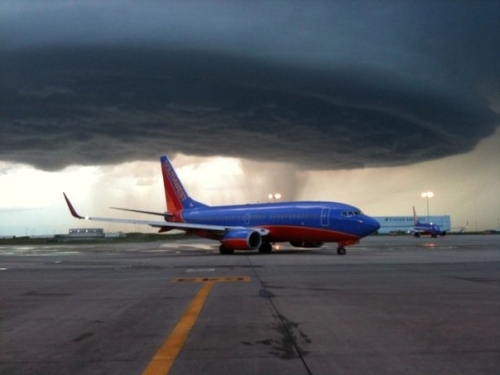 Midway is one of Southwest’s largest hubs, even though Southwest claims not to have hubs. There shouldn’t be a problem swapping aircraft. The more probable issue is the weather. Chicago and the Midwest have been having afternoon thunderstorms for the last few days. Southwest may be spreading out departures, preemptively delaying flights to ensure connections are made, and/or the FAA is instituting “flow control,” meaning it is purposely spreading out flights to ensure the safety of the skies in one of the most congested parts of the country. My biggest fear is that we leave the gate and then sit on the ramp for hours! Or that Southwest un-delays the flights, which they tend to do. I almost missed a flight once because of that! So I have to leave for the airport as if the flight were right on time. I’m charging up all my iDevices for what could be a long journey to San Francisco. My other fear for today is packing. Though Southwest lets bags fly free, they can’t be over fifty pounds. There is NO WAY I am taking two suitcases. Dragging one on the subway is already a pain. Leaving on a jet plane!!!! I’m jetting out of here! My vacation to San Francisco starts this Friday afternoon. I’m heading down to Midway. Despite my living geographically a bit closer to O’Hare, Midway is the easier airport for public transportation purposes. I’ve flown almost exclusively out of Midway in the last year. It is a very efficient airport with good food options. However I’m getting a bit bored with it. I guess I need to get out to O’Hare again. As you can see, I’ve checked in online with Southwest. I’ve gotten a boarding number A30! I paid for the Early Bird option. 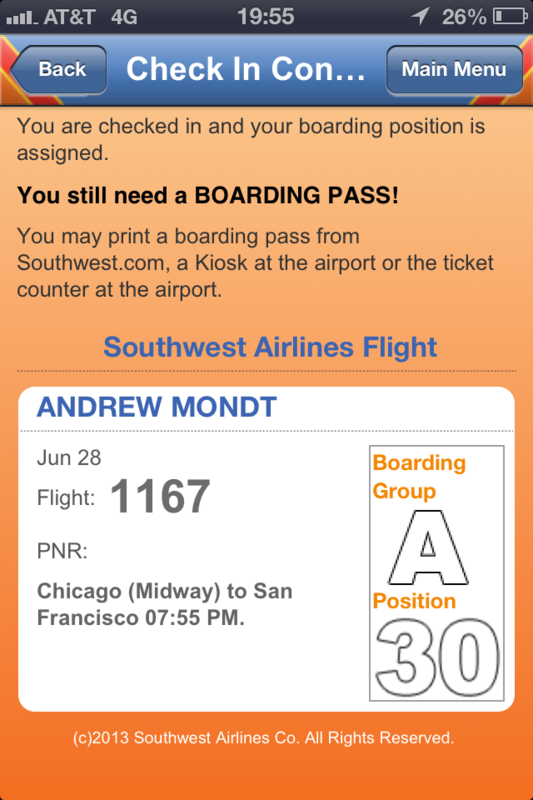 The thing to take into account on Southwest boarding positions is that A1 to A15 are blocked for Business Select tickets, elite frequent flyers or those willing to pay $40.00 at the gate to jump to the front of the line. So that position may be better than it looks. I’m going to soak in all that aviation goodness! Everything from the Sky Mall catalogue, safety card, condition of the cabin and many more details. My favorite seat is the second exit row window. Not only do I get to watch the scenery, I also can see how all those moving parts of a wing keep me in the air. Nobody needs an excuse to go to Paris. This week in particular for aviation geeks. Paris is host to the biennial Paris Air Show. It’s happening right now! The Paris Air Show is when the manufacturers flog their latest and greatest airliners. Obviously Boeing and Airbus are there in force. The big players in the regional market such as Embraer and Bombardier are there as well. COMAC of China, Sukhoi of Russia – among others that are trying to enter the market or expand into new market segments – will be there as well. If you have anything to sell to the commercial or military aviation markets you must be there. The Paris Air Show can make or break a manufacturer. It is that important. The airline manufacturers, particularly Airbus, often wait until Paris to make announcements of major orders. New aircraft types or updates to lines are announced as well, as the entire aviation world is watching. There’s no better place to make a big splash than at the Paris Air Show. The first half is an industry-only trade show. Airline CEOs and manufacturer sales teams wheel and deal orders that can run well into the billion-dollar price range. The second half of the Paris Air Show is open to the public. You can get up close and personal with aircraft that are on display. Of course aircraft such as the A380 or 787 Dreamliner will be there. The smaller vendors that may not break into the international market in great numbers will have their products on display as well. Seeing their planes can be a once in a lifetime experience. Along with the static displays, there are also aircraft flight demonstrations. You need to make sure you have spare batteries and memory cards for this experience! Aviation history is made in Paris. We aviation geeks get to experience it first hand. Geeking out at the street fair! One of the many reasons why I love living in my Sweet Home Chicago is street fair season. We have one virtually every weekend from Memorial Day through Labor Day. We Chicagoans need to get out and celebrate our often ridiculously hot and steamy summers because we know that our mostly ridiculously cold and freezing winters are going to arrive before we know it. So my friend Michael and I headed to the Andersonville Midsommarfest. It takes place every year in the old Swedish neighborhood. Along with Swedes, the LGBTQ community is well represented here these days. It’s a great way to start the summer. Lots of alcohol and the eye candy isn’t bad either! So how does it equal aviation geek? Two ways. Andersonville is known for it’s many stores that specialize in home decor. Just how many overpriced tchotchkes does one person need, you ask? Well, you never know where the next moment of geek might come from so you have to keep an open mind. We stopped in front of the Slaymaker gallery. They had the coolest art prints! 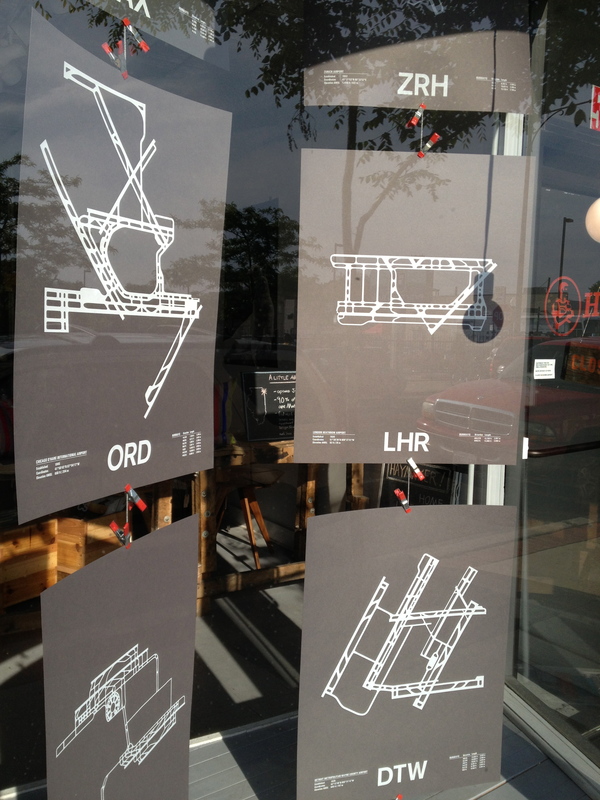 I was advised by the staff that they have over 38 different pieces from airports around the world! Must. Have. One! Three little problems: They were closing for the day, I have zero space left on my walls, and I don’t have the money to spare. In other words, nothing I can’t solve. And I will. The second moment of geek came at the street fair itself. I spied a gentleman with the most unlikely t-shirt. When I asked him if I could take a picture, we started chatting of course. His friends said something to the effect that I shouldn’t get him started because he may never shut up. A fellow aviation geek!!! The t-shirt wasn’t just an urban hipster’s ironic statement as I had feared. I let him know that his shirt would end up on my blog. He was totally cool with that. Seems we’re everywhere! Seems my last post was on a topic lots of people have opinions about. As luck would have it, CNN posted an article written by Katia Hetter with input by architect Paul Goldberger, who obviously has an expert view on the subject. I called airports cathedrals and the CNN article compared them to the great train stations. Many people have posited that airports today are what the cathedrals were to medieval Europe. These cathedrals were so much more than places of worship. They were also a way for towns to showcase engineering and artistic skills, along with the wealth of the patrons. Each cathedral had to be the tallest, most beautiful and awe-inspiring one ever built to that day. It was a proud statement by the people that built it. A modern international airport is often built and measured using virtually the same criteria. One of the best examples of such an aviation cathedral is Washington Dulles. It was one of the first airports built specifically for the jet age. Importantly, the original terminal still stands as built. It has not been obscured or modified beyond recognition as often happens when airports get expanded over time. It has been expanded, however, and in the process become considerably less passenger friendly. The sweeping roof soars as if floating above massive walls of glass. It celebrates the excitement of the new jet age. It is considered a masterpiece of the world famous architect Eero Saarinen. 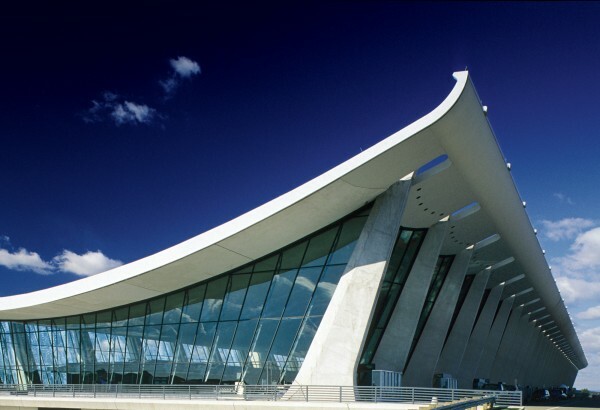 Dulles is so iconic that many of the design features have served as an inspiration to or have been blatantly copied by less inventive architects. A great world capital deserves a magnificent aviation cathedral and Dulles is it. Another great example of a newer aviation cathedral is the Seoul Incheon airport. It ranks as one of the top airports in the world. The architecture is impressive due to its huge scale and modern, airy and highly efficient layout. Incheon is a leading innovator of the concept that the airport is more than simply an efficient way to board a flight or make a connection while hitting the duty free shop. The airport, with its architecture and many unique amenities, is a destination in its own right. Incheon gives the impression of wanting to prove that South Korea has become a modern, innovative world-class country. Medieval cathedrals often took many decades to build, and sometimes the huge stone structures would collapse mid way. Massive cutting-edge construction is challenging regardless of the era. Berlin Brandenburg airport is a modern-day example of this kind of disaster. The airport was meant to be the calling card of a dynamic, unified Germany. It was to be ultra modern and efficient for both airlines as well as passengers, and the most environmentally friendly airport ever built. In other words, very German. This is not the case. Berlin Brandenburg Airport is currently running at least three years late and billions of euros over budget, and there have been massive engineering and construction errors. This ineptitude has led to major political scandals and is a source of great embarrassment to the German government. Airport cathedrals are getting more competitive. Emerging economies, particularly the Middle East and China, are building like crazy even if they are not yet economically viable. For better or worse, they are racing to make a statement with their aviation cathedrals: They have arrived. This is a brief follow-up to my last post. In retrospect I didn’t share just how proud I was of American Airlines and my job with them. We didn’t consider United or Delta our competitors. 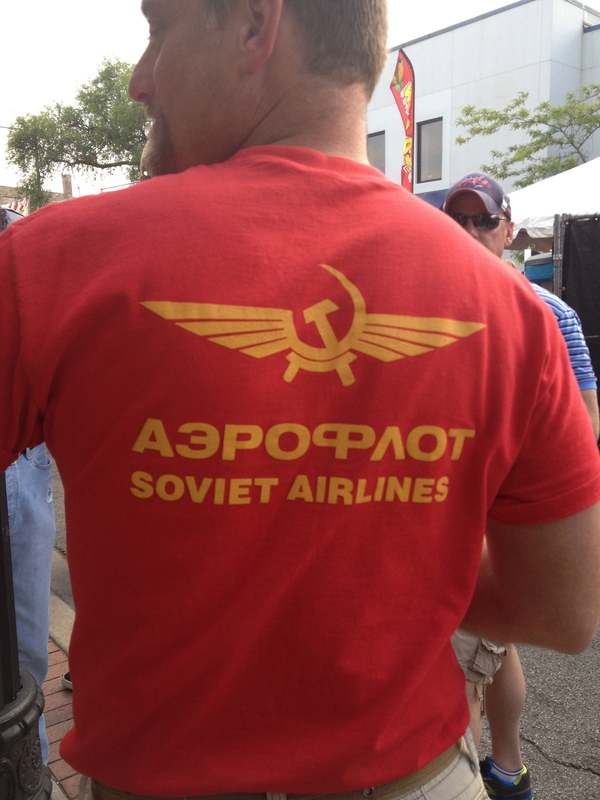 Our competitors were the European airlines. That’s the reason my department was created at O’Hare. We were to be the best trained and elite agents at O’Hare. We had to be multilingual. We were to be the face of a truly world class airline. Most of the time we were. American dismantled the European hub at O’Hare slowly after I left. 9/11 killed it completely. When American dropped Flight 84 to Frankfurt It was a sad day for me. I was assigned that flight almost every day. I linked the commercials below as they are from my time with American Airlines. They capture the zeitgeist of what we were trying to create at O’Hare. These are Chicago specific and focus primarily on Europe. The first commercial describes it best. The staff in the commercials are actual American Airlines staff.